As a strategy to improve Americans’ health status and reduce healthcare costs, the Affordable Care Act (ACA) allows employers to place up to 30% of total health insurance spending “at risk” for employees. Employees can keep/earn that share by participating in programs to reduce chronic disease risk factors and/or by controlling their cholesterol, blood pressure, and body mass indexes (BMI). Partly as a result of this provision, chronic disease risk factors have become a primary focus of many if not most major employers in America. Whether these wellness programs have worked is beyond the scope of this posting, but is unresolved. In 2010 Health Affairs published an oft-cited (albeit challenged and undefended) meta-analysis finding savings with these programs. This conclusion was directionally confirmed (except for randomized control trials, which showed a negative return on investment) by a 2014 meta-analysis in a wellness trade journal. Conversely, the Incidental Economist published several pieces on the questionable finances and other concerns raised by these programs. The Bloomberg BNA Healthcare Policy Report published a concise summary of the “con” argument. A 2014 RAND study of PepsiCo found no savings. Instead, the question to be addressed in this article is not who is right or wrong in this battle but rather whether we are fighting the right battle in the first place. Is there so much chronic disease—and is it so out of control—that self-insured employers should be spending up to $500 per employee per year plus incentives to try to avoid costly cardiometabolic events? Recently—the impetus for the author checking the figure and writing this article—the CDC hiked the 75% figure to 86% of our nation’s healthcare budget being spent on people with chronic disease. This question is easily answered using the Agency for Healthcare Research and Quality’s Healthcare Cost and Utilization Project (HCUP) database: No. 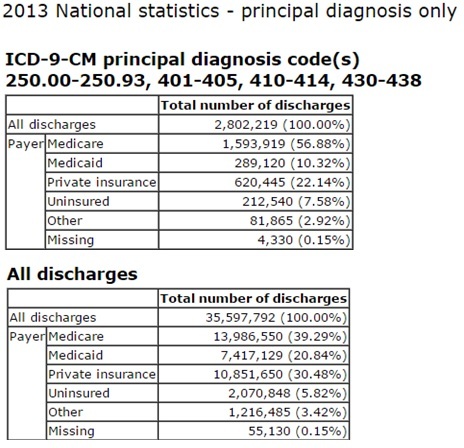 There may be some narrow semantic sense in which this 75% or 86% statistic is true, in that people with one or more chronic diseases are more likely to be hospitalized for anything than people without them, but that doesn’t make their chronic disease the cause of their hospitalization. While it is impossible to prove a negative, employers appear to be focusing on none of these items, partly explaining the composition of the list. And a simple review of the employee health trade journals shows far more emphasis on chronic disease screenings than avoiding low-value care. The authors have discovered no health risk assessment—another standard tool for wellness programs—addressing these procedures, and they believe none is in common use. 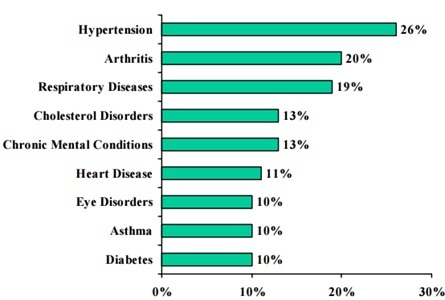 Wellness proponents might argue that wellness could reduce the incidence of many of these DRGs by helping employees lose weight. However, employer weight-loss incentives don’t seem to help employees lose weight. And in the most recent award-winning wellness program (McKesson’s), BMI actually increased. If award-winning programs can’t reduce BMI, it’s difficult to see how lesser programs could. 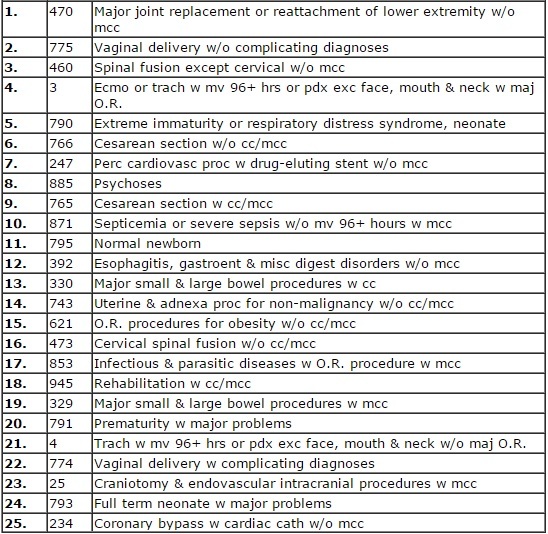 Bariatric surgeries (number 15) are on the list. One could argue they represent either the failure of wellness programs or their irrelevance. Either way, if employers really could help obese employees lose weight, it’s as unlikely this category would appear in the top 25 as it is that employees of a corporation with an award-winning program could gain weight. Sepsis makes the top 10. This problem could be addressed with benefits design the way Medicare does it: pay hospitals more for each case, but don't pay them for hospital errors and infections, thus giving hospitals an incentive to reduce infection rates. The ranking of infections should steer more employers towards membership in, for example, the Leapfrog Group, which emphasizes the importance of reducing hospital errors and infections. Should the Federal Government Change Course? In the executive branch, the Equal Employment Opportunity Commission (EEOC) is actively considering regulatory changes under the Americans with Disabilities Act that would classify participation in any wellness program, no matter how large the fines up to the ACA limits, as “voluntary,” thus depriving employees of any rights of recourse for perceived unfair treatment. Likewise, the EEOC’s proposed changes to the Genetic Information Nondiscrimination Act would have the practical effect of stripping employees of the right to voluntarily withhold their medical and genetic information from their employers. The HCUP data suggests that the focus of both branches of government should be elsewhere, such as encouraging employers to help employees avoid low-value care. As it stands today, employers are allowed to demand intrusive medical exams and even employee DNA, and if employees don’t comply, they can be fined. But they can't simply tell employees: "You need to complete this education module on the benefits and hazards of spinal fusion before being approved for one.” In addition to being unable to penalize employees for overuse or incentivize them to avoid overuse of inappropriate care, employers aren’t even allowed to know about employees’ decisions to get it. After having just criticized wellness programs for being too prescriptive, we don’t want to be too prescriptive ourselves. Deeper dives are needed to figure out where the greatest policy and corporate opportunities are. Nonetheless, at a very minimum, the data suggests that a pause in the headlong rush to “do wellness” is advisable while more research is undertaken to identify the best opportunities to help guide policy makers, employers, and health plans on where to focus their educational resources. 1. The “most of which are preventable” modifier that often precedes this statistic appears to have originated with Johnson & Johnson. If that were true in anything like a literal sense, many people could live forever.